From the editor’s introduction: It is easy to get the sense that in today’s public sphere so much of our discourse happens at each other as opposed to with each other. Sound bites and 140-character messages do little to help others understand our positions, and the louder we shout the less we are heard. Education, however, is about communicating, and that requires the ability to listen, often to multiple voices. We want our students to be able to process that, but for them to hear their teachers, their teachers need to be able to hear them. The same is true for all the other communications which take place in our schools – between parents and teachers, between the principal and the board, between administrators and teachers, and more. When everyone is on the same team, or at least is able to have a respectful dialogue about how to move forward, then education can happen. The same is true with the many different segments of the Jewish community. Ideological differences can be used as swords to fight sacred battles or as vehicles for exploring real meaning. One of the hallmarks of our programs at The Lookstein Center is that they seek to bring together disparate pieces of the Jewish puzzle and help them understand what they can learn from each other while acknowledging and respecting their differences. 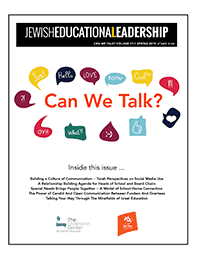 This current edition of Jewish Educational Leadership, the first in our new format as an online-only journal, is dedicated to opening up the conversations. The articles included touch upon all the key players in schools – students, teachers, administration, parents, board members, and funders. There is much more to be said than what appears in the articles, and we invite you to join the conversation and share your thoughts as well. 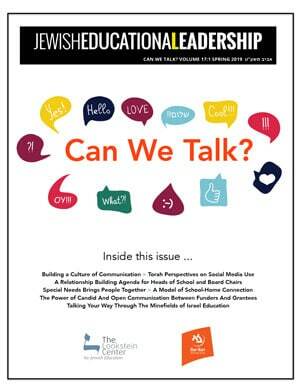 We also invite you to join our other conversations, especially those in which educators from across the spectrum communicate with each other. We recently launched The LookJED Hub on Facebook and a new format for LookJED conversations, with an eye toward broadening the community. And, of course, we want to hear from you. What issues are burning for you in your classrooms, your teacher rooms, and your board rooms? What partnerships are you looking for with other schools to share ideas and resources and learn from each other? We look forward to being there to help realize those hopes, get ourselves talking and learning together, and helping to enhance what our students can get from their experiences.